Since its beginnings in 1888, YWCA of Schenectady, dba YWCA NorthEastern NY has served women and families in Schenectady and the surrounding region. 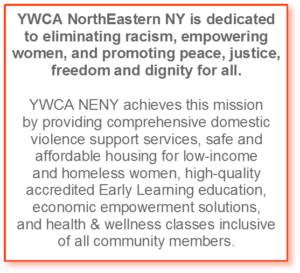 Throughout its 130-year history, YWCA NENY has been a constant innovator in providing programs and services to meet the changing needs of the community. It is a charter member of YWCA USA, the oldest and largest women’s membership organization. Housing Program provides safe housing and services for homeless and/or low-income women. Support services for the women include advocacy, counseling, support groups, information and referrals, health and recreation opportunities and an emergency food pantry and clothing closet. YES Program – YWCA Economic Solutions Program is an economic empowerment initiative designed to assist domestic violence victims and homeless/formerly homeless women in obtaining employment, education, and financial stability. It provides life skills counseling, employment exploration, communication techniques, and stress and time management. VITA/CA$H Program provides tax preparation and financial education services.